Home Toolkit Business Basics What is “Pantone colour” and why is it important in fashion design? I’ve searched and searched to find out where the name Pantone derived from. So far I have failed so I decided to hazard a guess and assume that it stands for Paint Tone. Between 1956 – 1961 the New Jersey-based company was a small enterprise that manufactured colour cards for cosmetics companies. In 1962, Lawrence Herbert, an existing employee, bought the company. He immediately changed its direction, developing the first colour matching system in 1963. The company’s primary products include the Pantone Guides, which consist of a large number of small (approximately 15×5 cm) thin cardboard sheets, printed on one side with a series of related colour swatches and then bound into a small flip-book. For instance, a particular “page” might contain a number of yellows varying in luminescence from light to dark. The idea behind the Pantone Matching System (“PMS”) is to allow designers to ‘colour match’ specific colours when a design enters the production stage – regardless of the equipment used to produce the colour. This system has been widely adopted by Graphic Designers, Reproduction, and Printing Houses for a number of years now. Here you will find the right factory to work with you on your idea. Pantone recommends that PMS Colour Guides or swatch books be purchased annually, as their inks become more yellow over time. However, if you’re on a budget this isn’t always possible due to the costs. Colour variations also occur within editions based on the paper stock used (coated, matte, silk, and gloss). The PMS expands upon existing colour reproduction systems, such as the CMYK process. The CMYK process is a standardized method of printing colour by using four inks: cyan, magenta, yellow and black. The majority of the world’s printed material is produced using the CMYK process. The PMS is based on a specific mix of pigments to create new colours, referred to as Spot Colours. The PMS also allows for many ‘special’ colours to be produced such as metallic and fluorescent. While most of the Pantone System colours are beyond the printed CMYK gamut, those that are possible to simulate through the CMYK process are labelled as such within the company’s guides. Pantone colours are described by their allocated number (typically referred to as ‘PMS 130’). Similar to the paint strips you can pick up at DIY shops, this guide shows blocks of several related colours with names printed alongside each colour. They’re printed on coated, uncoated, or matte finish paper. The guides, which are fastened together at one end, enabling you to fan them out, can be bought separately or in sets. These swatch books come in 3-ring binders with pages of colour blocks. The chips are small tear-off samples of colours. This format is ideal for providing samples with your artwork or digital files so that clients or printers can get a more accurate picture of how the printed colours in their project will appear. It’s best to avoid purchasing any books prior to 2004, as the coated and matte stock used in all guides was updated at that time, resulting in some colour differences from previous books. The latest innovation in colour guides, Digital chips allow you to match over 1,000 PANTONE Spot Colours with their process colour equivalents and the output from a Xerox Docucolour 6060 digital press. The tear-out chips come on coated stock. The importance of Pantone Colours in the fashion industry cannot be underestimated. As internationally-recognized numbered shades and colours, they form the basis of consistency from design, development, and production. The portable Cotton Passport holds all 2,310 Fashion, Home, & Interiors colours in an easy-to-carry format, allowing you to check fabric colour in the stores, on customer visits, or at the mills. The Cotton Passport is the only guide that’s organized in an accordion format, allowing you to view and select from all colours at once. The Cotton Chip Set is the most affordable palette development tool for designers in the textile, fashion, home, and interior industries. A two-volume reference of the 2,310 Fashion, Home, and Interior System market-driven colours, the Cotton Chip Set features removable tabs that allow you to lay colours side by side for palette selection, presentations, and colour communication. Both of these items are expensive for a start-up company. When I need to colour match to fabrics or leather I access Pantone shades via their website. The full range of shades is available there so I usually take a screenshot of my selection and save it to my desktop. These can then be used in any documents or mood boards that I carry with me to fabric shops or to show clients. Purchasing Pantone colours inexpensively is possible if you source used sets via eBay. While it’s important for professionals such as print shops to update their charts every year, fashion designers can use second-hand ones and update them every three years. Remember, it’s the condition of the set that is important, not the age. What does the Pantone code mean? The Pantone for Fashion and Home colours are identified by two digits, followed by a dash, four digits, and then a suffix. One of the special features with the fashion and home palette is that its colours have proper names. In addition to the PCS, Pantone also produces colour trend reports for fashion designers. Every season the team at the Institute evaluate the colours shown by designers in their collections at New York Fashion Week. The Pantone Fashion Colour Report is then created with the gathered information. The report highlights the top ten colours for women’s and men’s fashion for the upcoming season. London Fashion Week has recently been added to the seasonal colour report. Purchase used sets from eBay. Keep colour sets in their case and away from heat and direct sunlight, to prevent fading. Do not purchase any used books prior to 2004. 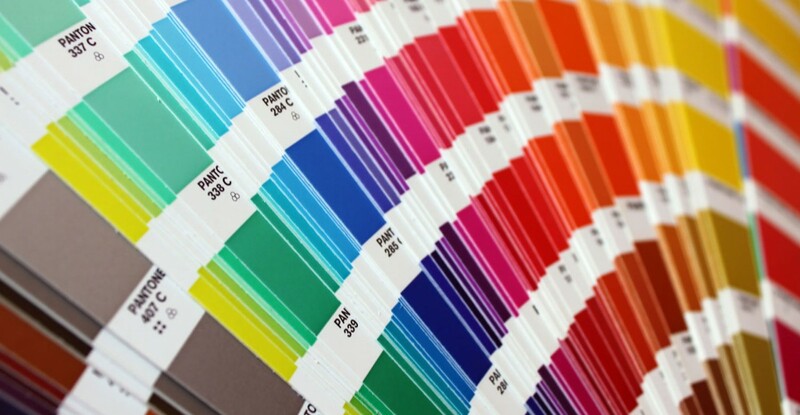 Develop a set of signature shades called a palette, that become part of your brand identity. Pantone shades are produced on uncoated and coated card. Select the uncoated cards for true colour matching. Now that you have become a pro at the Pantone Colour System, here are some do’s and don’ts of communicating with factories.